We are unable to manifest our Souls because of the ignorance embedded in our mind of many incarnations. Each person’s ignorance is different from the other. Nobody in the world knows where is the seed of the ignorance seated? The seed of ignorance is in the manas or mind. One has to go up to the last layer of the depth of the mind to remove the ignorance. The soul has wonderful peace inside it. But to manifest that divine peace inside the soul, the ego and all the gravels of ignorance ought to be mined and thrown out. But what stops a human being or a seeker to not let the ignorance which is a covering over the mind from uncovering the truth of its Soul? The soul is buried inside the heaps of layers of ignorance. Reluctance to admit and accept the liberating knowledge and truth do not allow the liberating knowledge released by the holy Masters to seep into the mind. Their ego stops them from future learning, and they insist and assert that they would like to remain in that state of mind because they know more and they know better. 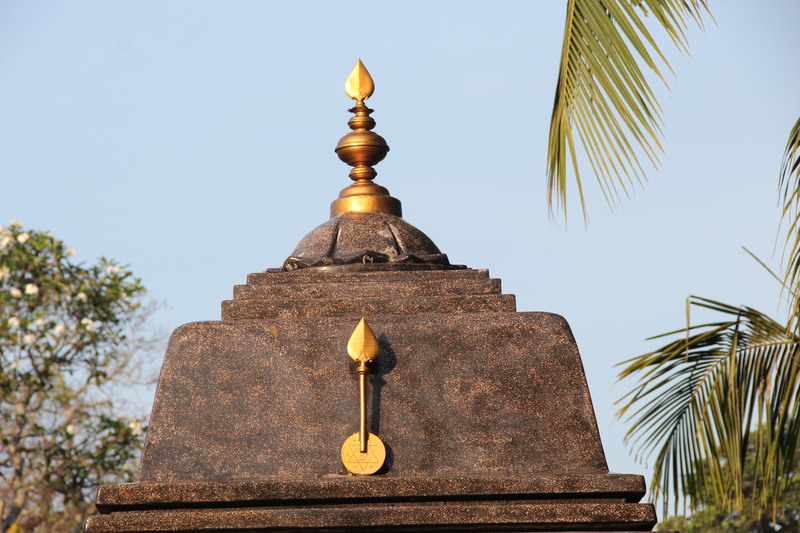 Earlier the rishis or sages, set out in search of the Truth and lived in harsh climate and hard life conditions to be able to concentrate their mind in their pursuits. They were humble and chaste and therefore with their continuous attempts and hard work, they were successful in knowing the Truth buried inside. God helped them by giving them the sacred knowledge and Divine wisdom by showing them the path that belonged to the sacred Masters and God guided them towards those Masters. Intense tapas or hard toil and spiritual attempts are performed by those who have surrendered their ego or any drive and they have enough patience to allow Divine turn of events that will manifest on their own by the will of God. Holy and divine, sacred places of great penance are chosen and made by the will of God. So the holy souls come to such places and meditate for a very long time in that surcharged atmosphere to realize the Truth and know the mysteries about God. The great realizations occur only at holy and sacred places wherever they may be. Those disciples, who surrender to their Gurus or Holy Masters, are guided by them to step up their inner efforts and they benefit from prior made Holy spots, inhabited by holy souls. As the atmosphere is already surcharged by that Divine wisdom and peace, so naturally, the present day disciples are able to easily access mentally, by entering into the Divine atmosphere by meditating in those caves or other holy spots. Their Holy Masters are aware about the progress of the disciples and they encourage and support them in all their endeavours and liberate them from their existing ignorance or ‘avidya’ lingering over many lives. As the disciple has laid down his entire personality at the holy feet of his or her Master, in order to purify himself at the hands of the Guru, the Grace of God and the Holy Masters is bestowed on the disciple. The disciple should have incessant patience and the will to cut through all the layers of the existing Maya or ignorance. Those seekers, who have completed the whole process of purification and cleansing, undergo further hardships or penance in order to reach the uppermost level or realm of Divine Consciousness. The liberating knowledge of Moksha is very sacred and should be possessed by the aspirant in order to free him or her from all the grave errors occurring in future and also to liberate himself from the effects of suffering lives and difficult life situations. 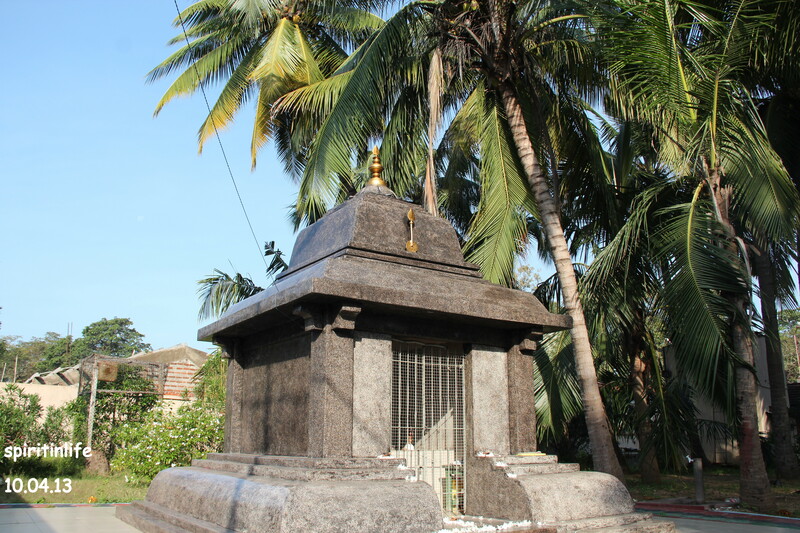 I am at present in Katargama in Sri Lanka and have come to meditate at the holy spots of Katargama Devale where Shri Mahavatar Babaji did intense tapas in the dense forest under the Banyan Tree and the Bodhi tree by the will of God. Today the majority of people are unaware about the Divine spots at which the humans can meditate peacefully and cure the chronic disease of ignorance. 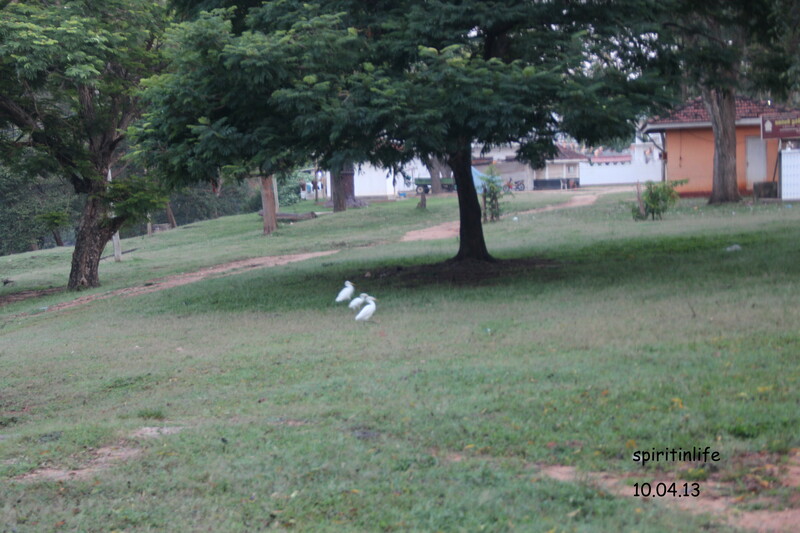 There are two places or spots which are most sacred, although the entire area is calm, peaceful and holy. More than 1800 years ago, Babaji came here from Kashi, India and meditated in a very dense forest where no one could even penetrate. Babaji was free of every particle of Maya, yet he did intense penance for others and our Earth. He meditated for many days under a Banyan Tree without food and water and wished not to be disturbed. Unfortunately, one wood cutter who was filled with the raging desire of cutting this very Banyan Tree could not be stopped by anyone and in spite of being warned repeatedly of the alarming dangers, he went ahead and cut the same tree under which Babaji had meditated intensely. After a few days, the woodcutter was so full of guilt and shame that he took away his own life by hanging from a tree. 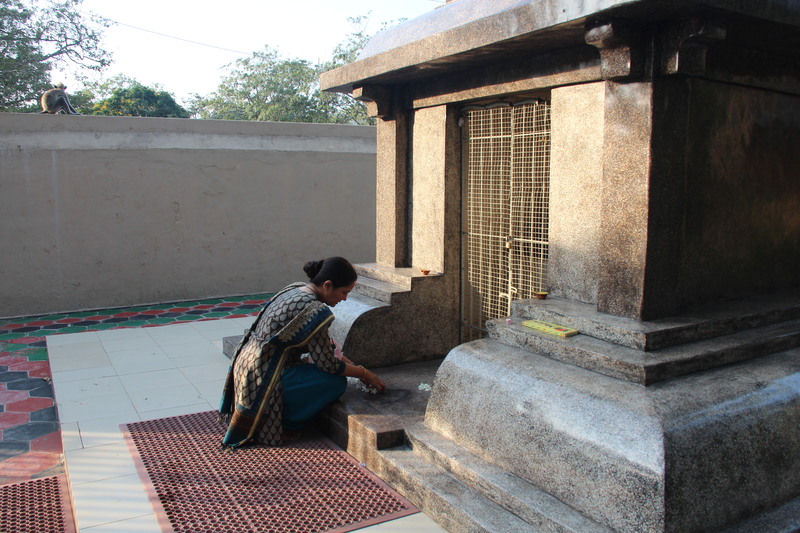 The office bearer whom I met this morning, told me disappointingly that they have been trying to plant a Banyan Tree again at the same spot where there is a modest temple of Babaji today, but all their efforts have failed. The new Banyan Tree that they plant, die and do not survive. This piece of information intrigued me and I was very curious to know the reason behind the dying of the Banyan Trees at the holy spot where Babaji once did intense penance and meditation. During my meditation a while ago, our dearest Babaji told me,“ The wood cutter was already cursed even before he cut my Banyan Tree and the curse lingered. The curse was because of his acts of deep ignorance. 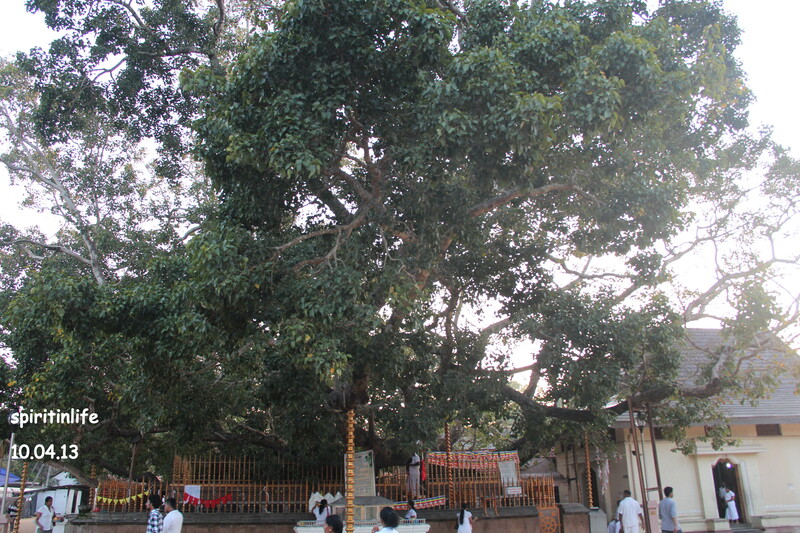 But there is another Peepal tree or Bodhi Tree in this precinct where I had also meditated which is alive with my energies today. 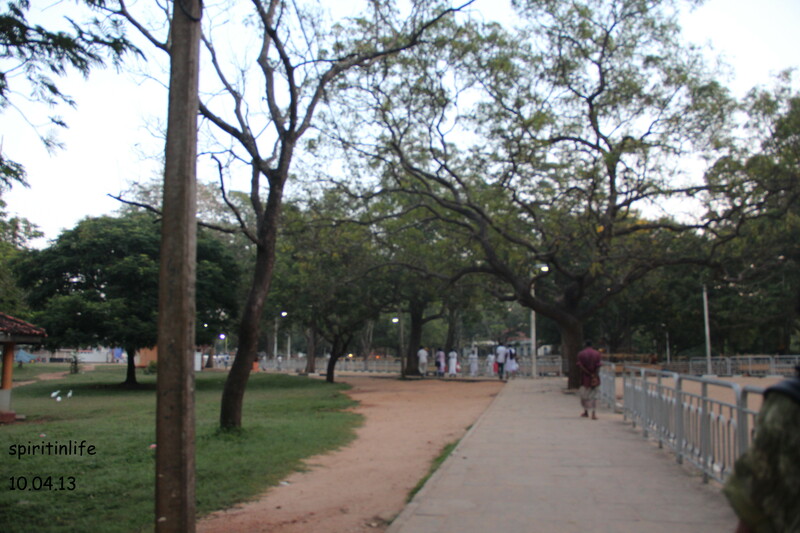 I used to meditate under it after the Banyan Tree was cut. You have already written about it (The state of Super Consciousness-I) that it has tremendous Sankalp Shakti and therefore you have come to this holy spot again to make an intense and strong resolution and to meditate with that resolution under the Bodhi Tree. It shall be fulfilled. Seekers who have unconditional love, complete faith in their Holy Master, shall be blessed with more courage and physical and mental strength to pursue further learning by dynamic meditations. So utilize this time and go very deep inside until you know the inner most depth of your soul. Inhale my presence in this holy place through your mind and breath. Instill peace and calmness that will not break continuity of your mind with me. Distribute this Divine knowledge to those who surrender to you and who please me. Do not extend help to those who are densely ignorant and covered with mud of darkness because the sacred knowledge of the Divine is given at the mercy and the will of God to those who have surrendered their individual self at the lotus feet of their holy Gurus. Invoke love and gratitude in those hearts who are willing to serve others and refrain from those actions in which you lose your precious time. 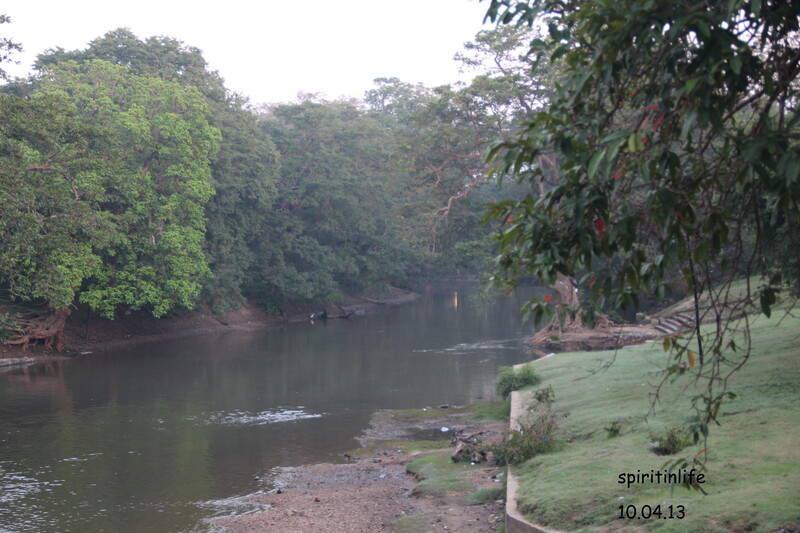 P.S As I am at this moment touring Sri Lanka, this post will be revisited and revised again. If I am able to get the pictures of the sacred spots of the trees under which Babaji meditated, then they will be uploaded later. Thanks. 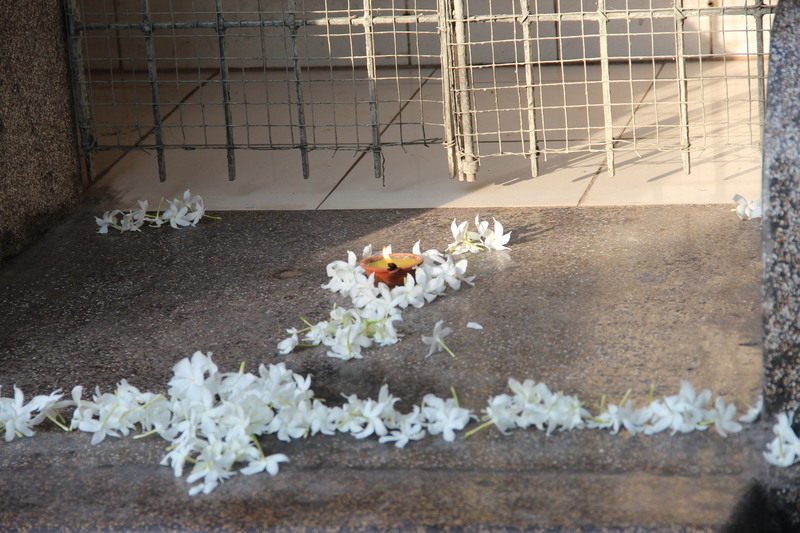 As mentioned last time that if permitted by the temple authorities, I would like to take pictures of the two holy spots where Shri Mahavatar Babaji had meditated. 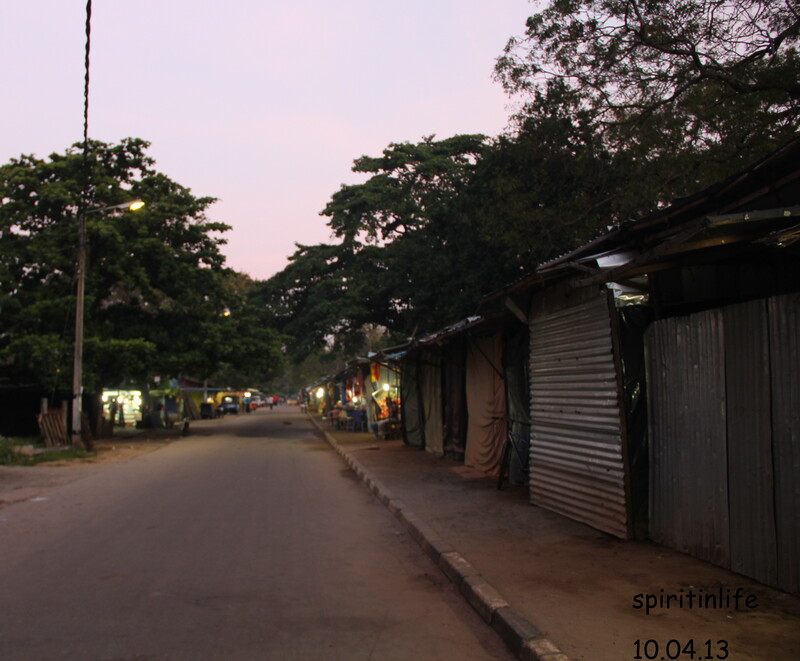 So here are the pictures that were taken on 31.03.13 early morning in Katargama. 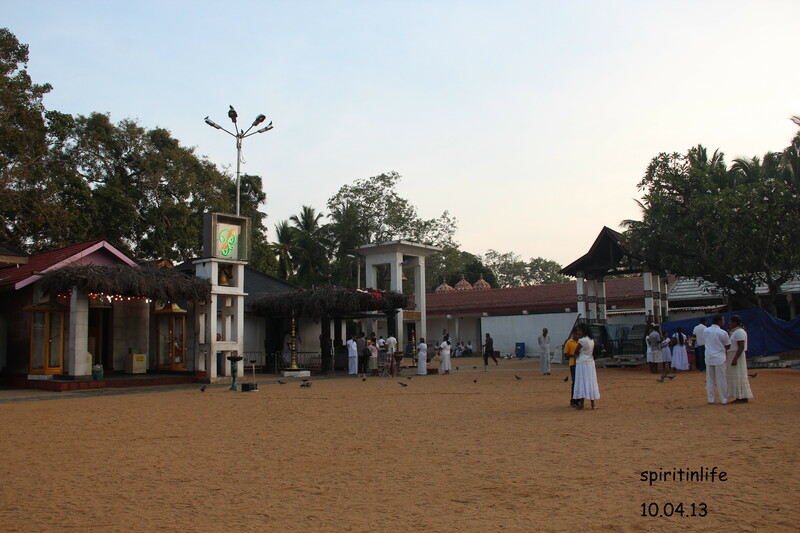 We begin very early to visit the Holy Shrine or Devalaya to avoid the buzzing of people in order to take good pictures and to meditate peacefully. At 6 am we were at the holy Shrine. 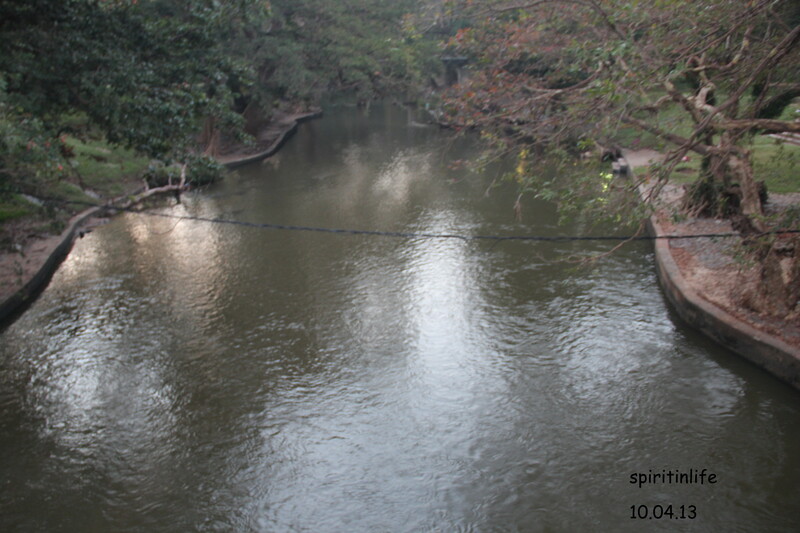 This is a river named Manik Ganga that flows next to this Shrine. Maybe it was much closer to the place many years ago and has shifted as there is sand in the premises. Inside the premises, one can easily divide the area in two parts- the left side and the right side. In fact there are two gates on the huge wall. 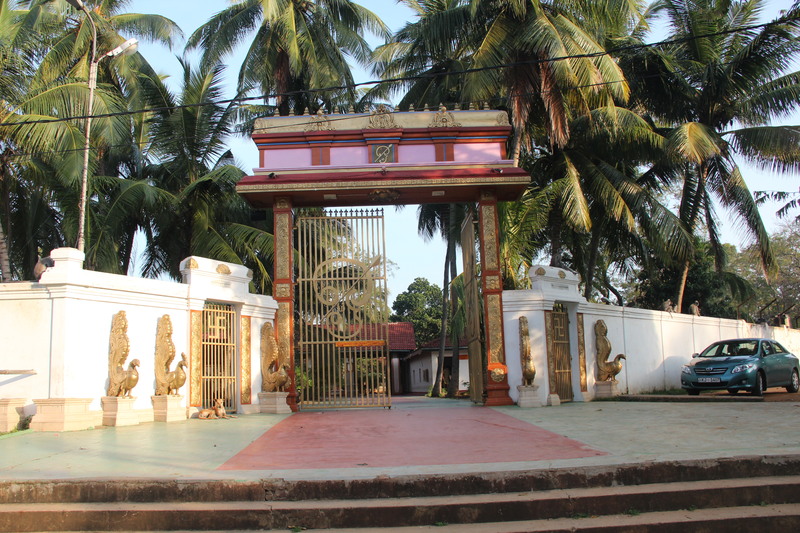 One goes from this gate to the Murugan Swami temple, Buddha temple and the Bodhi tree under which Babaji meditated and the right side has Hindu deities and the small temple built by Kriya Yoga people as a memory where Babaji once came to do penance. First let us see what we can see once on the left side once we cross this gate. 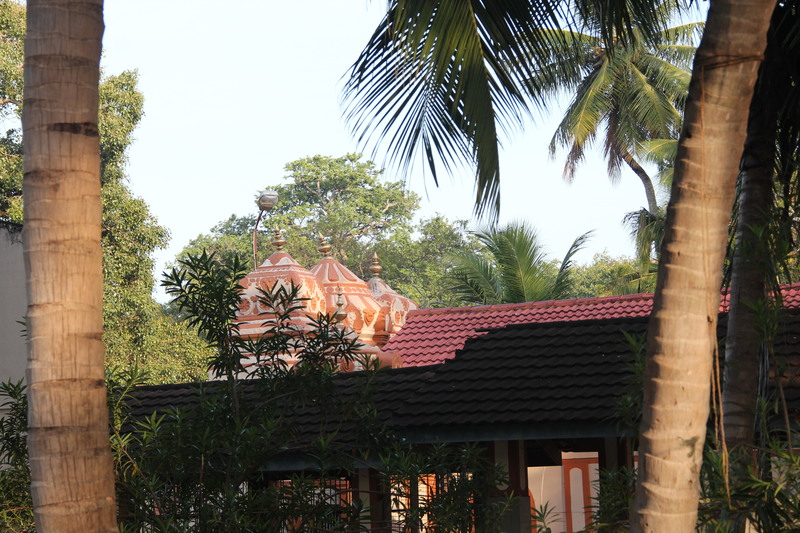 The very first temple on right is of Murugan Swami. 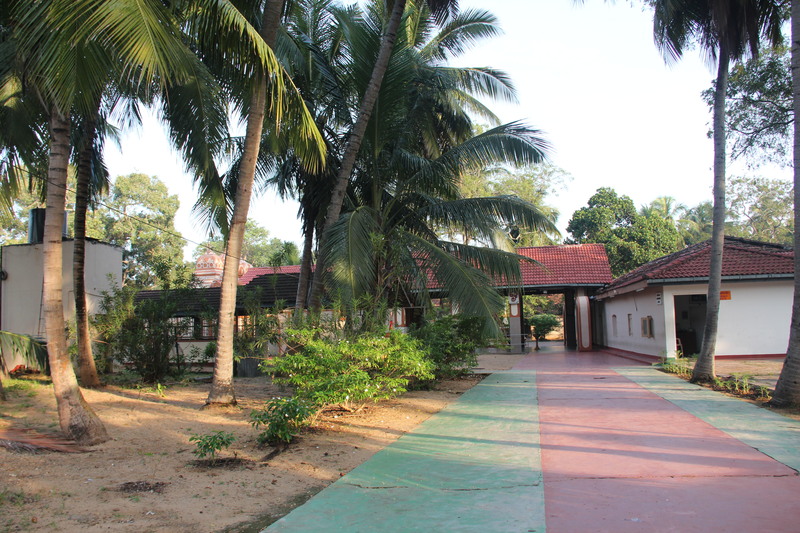 This is where he did penance many milleniums ago in a thick jungle. 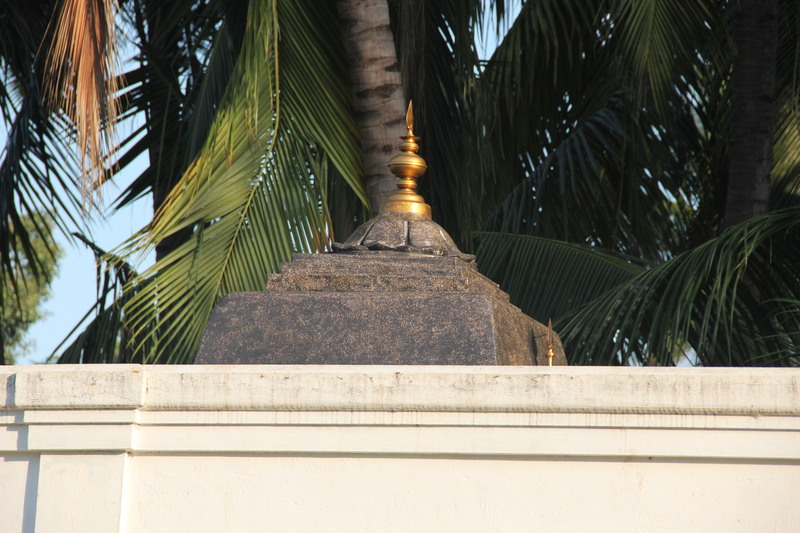 Just behind the left wall where there are two peacocks and a swastik, there is a small temple dedicated to Shri Mahavatar Babaji. 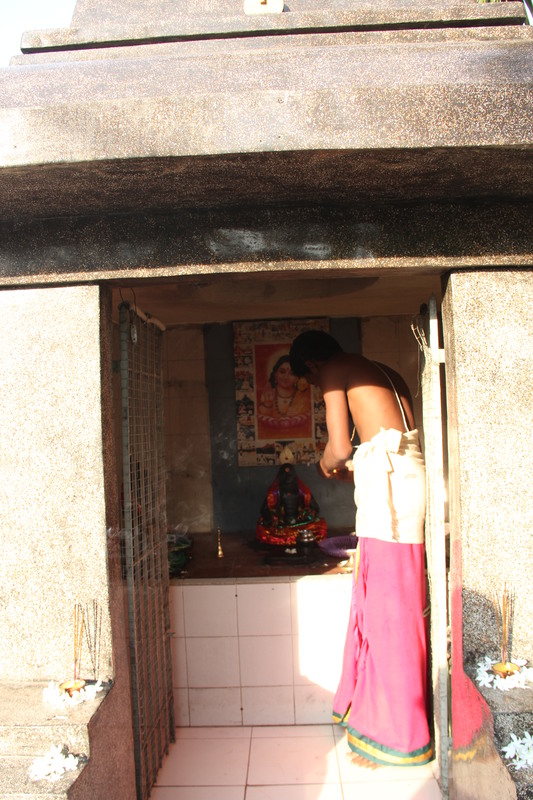 Inside the premises there are temples of Lord Ganesha, Lord Murugan Swami of Palani, Mother Goddess Parvati. A note All the historical sites associated with the life and times of Shri Mahavatar Babaji should be preserved and kept safe for posterity sake. 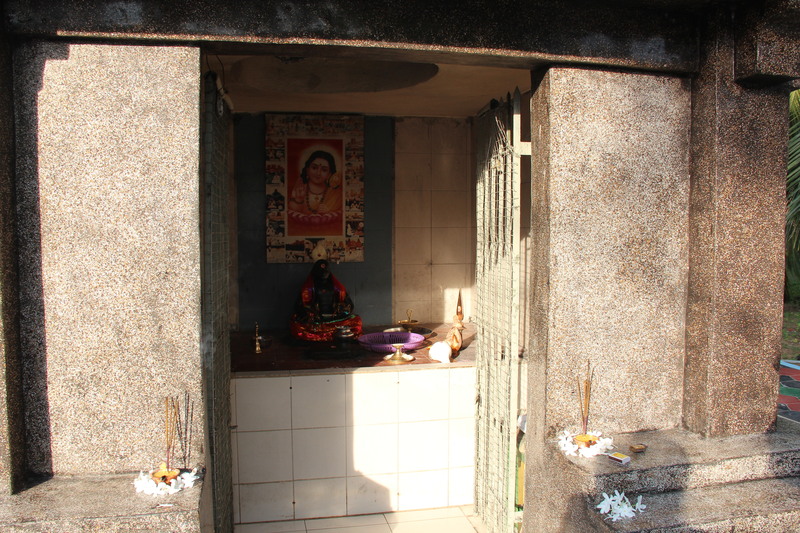 Whoever wishes to visit this site of Shri Mahavatar Babaji in Sri Lanka will now find it easy to find it and we can pay our respects and devotion at these holy places. Videos of this holy site. This entry was posted on Saturday, March 30th, 2013 at 11:32 pm and is filed under Uncategorized. You can follow any responses to this entry through the RSS 2.0 feed. You can leave a response, or trackback from your own site. Another wonderful Turn deeper into the Labyrinth that takes us to Our Beloved! The illusions of Maya no longer hold any surprises or temptations as does every Turn of this Beautiful Labyrinth. Dear child Nish, You can very well understand my state of joy and gratitude when Babaji revealed so much about his early life last evening. Who can ever uncover the mysterious cover of this Maya whether of the external or internal kingdom but for our dear Babaji.You should read this post atleast three times until you feel you have caught the depth of what I am saying. We all are truly blessed to be knowing about the personal life of revered Babaji.He is so very humble. He did not have anything to do penance for yet he did for all of us. So with my utmost heartfelt thanksgiving, I shall worship the holy sites once more where Babaji once came to do tapas. In true submission and loving gratitude to God and dearest Babaji. thank you for sharing this sacred knowledge. Will you please help me to know that how we can know this ignorance? and if a seeker is trying to lead a spiritual life very purely and still he faces problems frequently, then it is due to his sanchit karmas or his ignorance or it is his testing from his divine Gurus for his spirtual development? Dear Nirav, sometimes past karmas’ effects or sanchit karmas are hard to bear but you can sail through because you are getting enlightenment also at the same time with your good luck supporting you. Sorry for not replying to your previous mails in detail because of my very hectic schedule over last few months. Nonetheless, you are not ignored by me or God. I prayed for you and all the other sweet children of God who are readers of this blog and are trying to take a few steps up. Let this phase or time just pass gently and you should put your mind in spiritual actions so this stage should also seem impermanent one day. You will get to see a lot of photos surely where Babaji meditated for a very long time. Lots of love from me, please stay happy as God and Babaji will never leave you. Feel very blessed to read this post coming all the way from Katargama Devale. Please, Please, Please do post the pic for all of us. Thank you Babaji and Sarikaji !!! That’s greeeeeeeeeeeeeeeeeeat. Wow, video too. Dear Kangesu. I am very sorry to be replying to you after such a long time, please accept my apologies. I just missed you by sheer dearth of luck. My stay in Sri Lanka was a hectic one and since I have returned, I am recuperating. How I wish I had known that you will be in that country at the same time as me. If you had been in touch with me earlier, maybe that could have been possible. Anyway, by God’s will, we can meet some other time in India or elsewhere. Until then, please read the blogposts and stay in touch. I was crushing under tensions and it was a divine flame which burnt all of it.. Thanks for your constant love and reminder as to which direction to steer our wheel. A very deep meaning is hidden in these words….. Thanks for sharing a yet another wonderful post, which has a lot to teach us. Finally glad to see all these pics here. Thanks Shahid. At this time, I am also preparing two photo galleries of this trip so will share with everybody. Obviously, we all could not go there, but we can surely make a trip mentally with the images…. Sarikaji, THANK YOU very much esp for the HOLY BODHI TREE picture. I have saved it on my desktop and see it for a few minutes before I begin meditation. Sometimes while meditating with closed eyes, I visualize myself under this tree. Thanks a zillion !!! Shahid, since the past few days, I have been pondering over the power of sankalpa or thought. Maybe I should write a post on it again because it is crucial for us to know more about it. If you really go to see, I have not seen Babaji or any other Guru personally, yet I have received infinite knowedge from them and am still getting it? How? It is the mind that is connected to them always and the link does not break. So if you are connecting your mind and sitting silently by visualization and thus meditating under the Banyan Tree, you are receiving those thoughts and energies surrounding it. Therefore, know that your sankalpa shakti and ichcha shakti will not degrade now rather it will increase. So meditate in this manner, it is very beneficial. 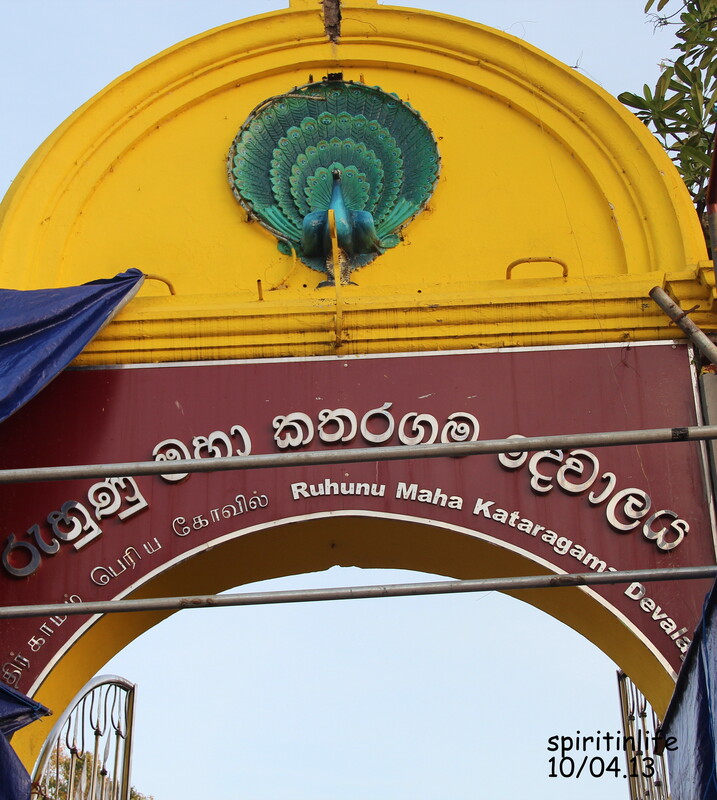 If I have put in so much time and energy in going to Katargama, it was not solely for me. It is also for others who worship sacredness in their hearts and have faith in my endeavours. 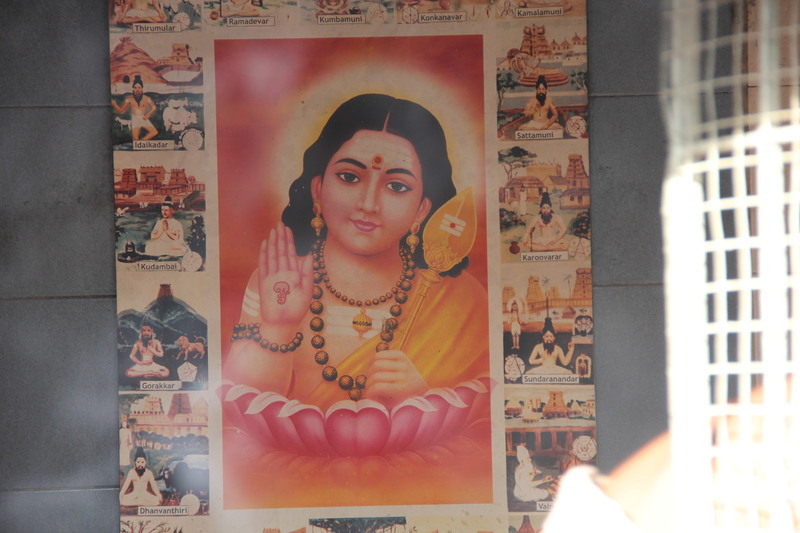 Pilgrimage to Katargama was for everybody. God knows who all made it mentally with me? It is for us to peep inside and realize that physically we may not be able to make it always but in mind, we can be with each other. If you sharpen and heighten your spiritual perceptions, you needn’t go anywhere. You will get everything in meditations. 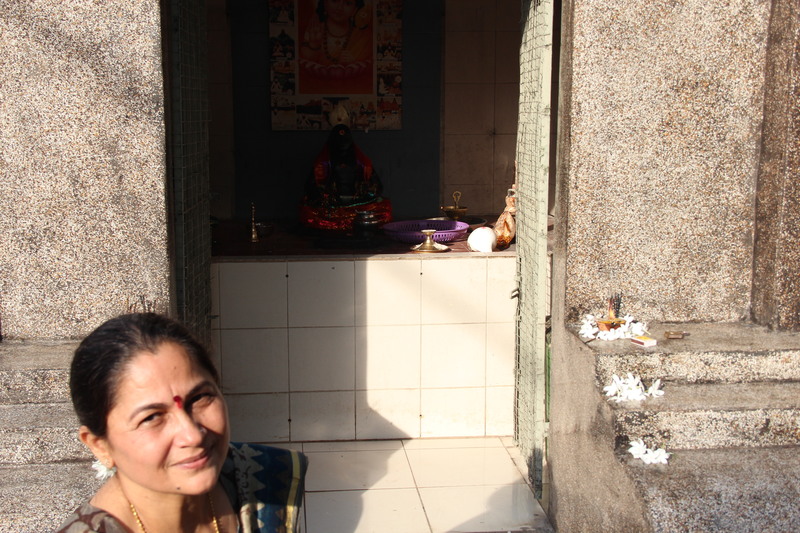 Imagine if I can someday make it to Babaji’s abode. Can we all go there? Not possible. But if you can travel with me by associating your thoughts with mine, you can meet Babaji in your heart and mind. And your Spirit will realize all this and that will be a very high state of mind for any yogi. Think about what all I have said and come to conclusions. you’re in point of fact a excellent webmaster. The web site loading velocity is incredible. It kind of feels that you’re doing any distinctive trick. Furthermore, The contents are masterwork. you’ve done a excellent task in this topic!